Ceci Prejean was a tomboy running around in Louisiana before her father enlisted help to turn her into a proper Creole lady. She fell in love with Trent Sinclaire, a northerner, and they were engaged to be married. 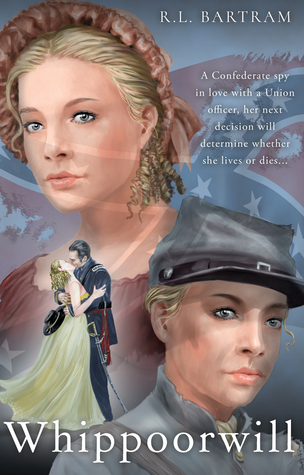 Before the wedding, the Civil War breaks out, and Trent is recalled north to fight. Heartbroken after her family is killed in the Battle of New Orleans, Ceci turns to spymaster Henry Doucet. Starting with Ceci being turned from a tomboy to Creole lady gives us a slow entry into the life of the antebellum South. The realities of slavery, class and strict gender roles are discussed in a somewhat glossed over way because Ceci's father is considered to be a kinder master than most; the slave Tilly is covered in scars from a previous owner, not because he had switched her himself. Ceci never questioned it because that was her reality, not until she saw the negative consequences for herself. She's young, only eighteen at that time, and at least doesn't feel it's her given right to own others, belittle them or torture just because she can. The courtship between Ceci and Trent is adorable, and you see the true emotion between them before the Civil War begins. There is worry as the time drags on and their courtship progresses to a marriage proposal. The wedding is postponed when the Civil War breaks out, and then further tragedy hits the Prejean family about halfway through the book. This fuels her decision to endure the training to be a spy, then take on the position itself. Of course that resolve is tested at times, but she warms to her role as a spy with the code name Whippoorwill. It gives us the opportunity to follow her through the war as well, to see it from the perspective of a spy, and in the roles of the women whose lives she inhabited in the North and South, as well as in the border states. Ceci's journey transforms several times over the course of the novel, and it really draws me in. All of the characters, even those that make only brief appearances, all crackle with life and energy, enhancing this novel.